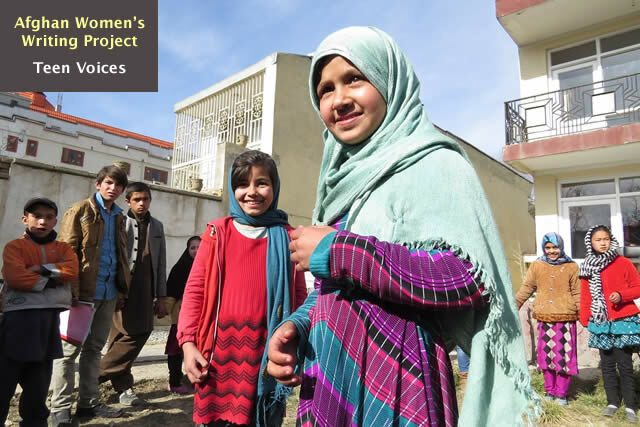 Editor’s note: The Borderfree Afghan Street Kids School in Kabul opened in 2015. Ninety-three Afghan street children attend the school run by volunteers who teach language and math literacy and tailoring. Fatema, 14, is the oldest among her siblings and to help support her family, she sells gum and cacao in Kabul’s Pul-e-Surkh Square, earning 150 Afg (about $2.16) a day. She cannot go to school but she still has dreams: she hopes to one day become a policewoman and keep people safe. Nearly two million Afghan children work to help support their families instead of going to school. Many are exposed to crime; most work even on winter’s coldest days. Often, they are responsible for buying food and fuel needed for their families’ survival. I work as a volunteer with these children. When I ask why they don’t go to school, they say they never had time to do homework so their teachers hit them and their classmates teased them. As a result, they hated school. They think if they don’t go to school, they can earn more money selling gum, wiping cars, or polishing boots. Gulsom, 15, works to support her family but also attends school. She is in fourth grade. She has six younger brothers and sisters at home. She sells cacao, polishes boots, and collects shoes she finds in the garbage to burn at home to help keep the house warm in the winter. She dreams of becoming a lawyer. And she hopes for a stable peace in Afghanistan that will provide opportunities so children do not have to work. Binazeer comes from Baghlan Province, and her family fled to Kabul to escape the fighting. She helps to support her family by selling bolani (flat bread with a vegetable filling) that her mother bakes at home. Despite her hardships, she goes to fifth grade and she hopes to become a doctor. Education is fundamental for the development of a country. It is not fair that our poor children are uneducated. I believe they have a right to an education and they shouldn’t be deprived of it. 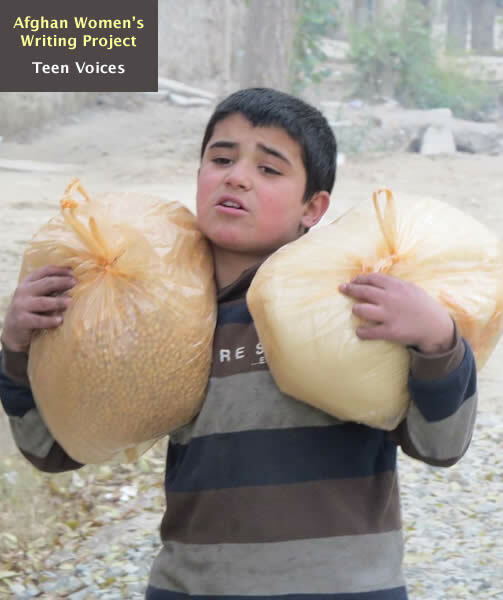 Last year a group of youth activists came together and established a school where these street children go to classes every day, and their families are allowed to collect a monthly donation of rice, cooking oil and beans, and clothes and a quilt for winter. 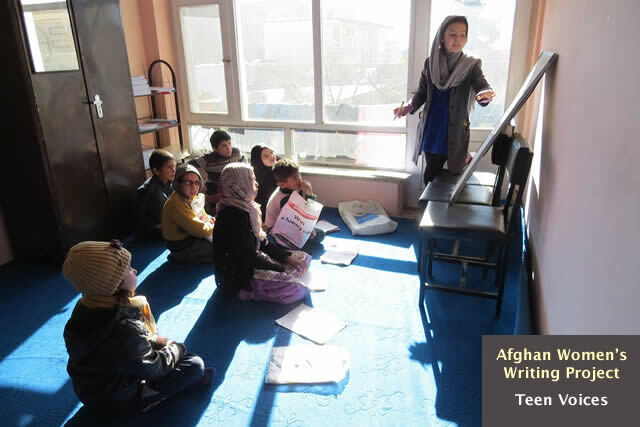 The Borderfree School teaches writing, reading, and math and two other subjects called “nonviolence” and “creativity.” Everyone at this school is working towards a goal of ending the war in Afghanistan and achieving a stable peace. In nonviolence class, the children one day symbolically broke all the toy guns and declared: “We are not the generation of war.” Instead of weapons, they vow to hold pens and books because they are the children of peace and kindness. At this school, we sow grains of peace in the children’s hearts; we believe the grains will grow and provide the fruitful reward of peace for the next generation. These children are learning to understand that they are crucial to the life of their country. I can see a potential for them to create a different future. I believe that today I help them, and tomorrow they will help someone else. Mahdi, 13, does this already. He works polishing boots, earning about $3 a day to help his family eat. Then he comes to Borderfree School to learn and to help us. Mahdi told me since this school rescued him from the darkness of illiteracy without expecting anything in return, he wants to help other people. So he helps us distribute blankets to families in need, and plans to do more once he is educated. His bravery and generosity and hopefulness are a model for some of us. When I used to see street children, I blamed government for not doing anything for them. Then I learned that government needs the collaboration of its citizens. I realized that I can study and go to school and I can help the poor people too. This is why I joined the Borderfree School to teach. I can help these children find their way to a better future. I believe there is strength inside these children that they don’t know they have. One day they will realize that they can be our young heroes and bring change. I believe the suffering street children in Kabul today can become the honest leaders of tomorrow. This piece has also been published by our partner, Women’s eNews Teen Voices. Photos by Mahtab’s colleague at the school, Hakim. This is a very encouraging story. I wish you, and all of the teaches and students, the greatest success! This is a wonderful essay! Thank you for enlightening readers about the good that is being done for street children in Kabul. Your optimism and theirs was uplifting and encouraging. I hope that you will continue teaching and helping these children and one day see your vision of them becoming honest leaders a reality! We learned that kids have to sell things to help pay rent and they can’t always go to school because they don’t have time for homework. We are inspired because they have to work and not have free time and some don’t have their parents but still they are trying and have hopes to go to school. We want to know what it feels like to not have the opportunity to go to school? We want to know how it feels to be in the war? How are you able to be safe? I really liked the story. I am only 15 and I wish i could visit the school for once. I know, I am a child but I have a dream for my country. I want to be a lawyer and wants to help anyone I can. we are the future of our homeland, we need to courage everyone to study, not everyone has this precious gift. I am really happy that there are people who think about our education and our country’s future. keep it up!!! Your essay about the power of the children of Afghanistan is inspiring to people from all over the world. You have helped us see into the lives of the youth that have fewer opportunities and are less fortunate. The strength of these children is astonishing. Everyday they are responsible for taking care of the family despite their young ages. For example, young teenagers are not able to attend school because they spend their time selling gum, shining shoes, and other small tasks to make money to support their families. Without any time for school, these kids are missing out on opportunities to learn and expand their knowledge. Fatema, who is only 14, has dreams of becoming a policewoman who can bring justice and peace to her streets. She must spend her time earning money for her siblings and parents and cannot pursue this dream because of the unfortunate circumstances in Afghanistan. Organizations such as the Borderfree School offer the education that children should be receiving. They provide writing, reading, and math classes for children as well as “nonviolence” and “creativity” classes. These extra courses give children powerful tools which can be used later in their lives, inspiring them to be a peaceful generation to spread love. 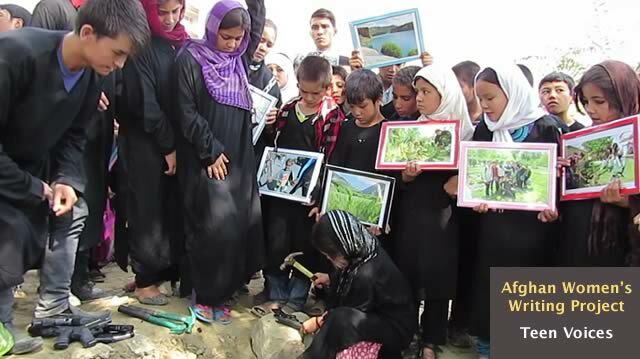 Organizations such as these are critical for the children of Afghanistan who deserve an education to help them grow and succeed as the world leaders of the future. The story you wrote about how the education and the dreams having for the Afghan children. According to the story, I get to know learning and going to school wasn’t easy for kids, they have to work to earn money for supporting their family. Selling gums and cocoa, cleaning the shoes, or wiping the car seems to be the typical works for the kids, it was astounding me, they got so heavy duty and worked to keep their family. But this didn’t overwhelm them; they still have the dream, and willing to become the doctor, lawyer, or the policewoman. But the environment making them abandon the dream. The Borderfree School making their dream come true, the provide them the food, clothes, and daily supplies, so they don’t have to worry about they need to earn money to support the family. And I happy to see that the children can have real classes and opportunity to go to school, and not keep this circumstance round and around make Afghan better and better. Dear Mahtab, I have mixed feelings after I read your essay. My heart aches as I see that instead of playing and learning with little to worry about, children have to strive for living at a very young age and even to provide for their family, while I’m also deeply moved by how they’re working so hard in effort to make their life better and pursue their dreams. It’s really inspiring and encouraging to see the power in their minds. I also feel heart-warmed by how you and all teachers in Afghanistan work so hard to help the children there. Your optimism, courage and perseverance are honorable. Hi. I am a student from China. I am really in touch with your story. I had been to a similar volunteer program before, and it was at China Ningxia. A poor area in China. I went there to do a p2p program for the villagers, but I also find out that there were a lot of children with great dreams can not take the school. The problem for the poor is similar around the world. I think you and your group can start some similar program like p2p to help the villagers earn money themselves and provide a better environment for their children. I’m a student from China. In your story, I feel so powerful and touched. Children like you in my country in your age mostly attend school, and lack of responsibility. Children in Afghanistan on street fight for a better life, because the current situation is hard for them and their family to live. But those children are full of hopes and dreams. They go to the street to earn the money to support the family daily cost. Also, they go to school to have an education. They know knowledge is important. Children in Afghanistan have lots of pressure for survival. And have a huge demand for peace in their country.